As the story begins, Master Splinter is training the Turtles. The Sensei is attempting to broaden thier spiritual scope, but their warrior’s hearts are still too strong to grasp the subtleties of their lessons. The Sensei probes each Turtle, to discern their strengths, weaknesses and phobias. Splinter senses that there is a weak link in their chain, and as he releases them from their training, each student bows before the master… save for Raphael, who has bound off to go swimming. Leonardo apologizes to Splinter for Raphael’s behavior, and the Sensei states that perhaps they are not mature enough to grasp the next stage of ninjitsu training. Upon hearing this, the other three Turtles angrily take off in pursuit of Raph. The Master is pleased, as group pressure is one of the lessons of ninjitsu. Leo, Don and Mike dive into the murky waters and find an underwater cave. As they emerge into the chamber, clubs in hand, they find Raphael bent over something. The three brothers approach their sibling with ill intent when Raph points out that he’s found some recently hatched turtle eggs. Everyone’s mood lightens as they find dozens of baby turtles swimming around their feet. The guys muse briefly about what it would be like had they remained normal turtles. As Raph investigates the shells, he finds one baby turtle stuck in the sand. When he examines it, he finds that a large leech has attached itself to the young terrapin. Raph is grossed out by the bloodsucking creature and uses a stick to remove it from the baby turtle. The other guys are amused that Raph is afraid of the leech and they attach it to his foot. Raph freaks out and yells at them to get it off of him. Leo, Don and Mike laugh and toss Raph back into the water. The three brothers run off, psyched that they finally “got Raph good!” Raphael emerges from the water and pulls the leech off of his foot. As he’s about to squish the parasite, Raph decides that it’s not the worm’s fault for being what it is and he tosses it back to the ground, telling it to stop picking on poor, defenseless turtles. The discontented Turtle than heads off after his mirthful brothers, warning them that they’ll be laughing out of the other side of their faces once he catches them. The next day the Turtles have resumed their practice with Splinter, but they still fail to grasp the inticracies of his lesson. As the Sensei mentally scans the region, he looks for a sign that the Turtles are opening their minds… but none are able. Raphael, more than any other, struggles. As Splinter views the surroundings, he is alerted to something in the water… a large leech. It is hungry… and has a malignantly cruel and evil presence! Master Splinter is shocked by his discovery, and involuntarily he jerks away from the vision. The violence of the Sensei’s recoil shocks his pupils and sends Raphael into unconciousness. The next day the Turtles are lounging around the river without their Master. Leo, Don and Mike are trying to make peace with Raphael, who is angry with them for how they treated him in the cave. The boys spot a large snapping turtle swimming across the creek and are shocked when they see something attack her. The brothers dive into the water and see a very big leech. The parasite seems oddly familiar to the Turtles, and they chase it. The worm takes refuge in a small cave. Raph decides to trap the leech in the hole by blocking the entrance with his shell. Raphael then sends his brothers off to fetch their weapons, so they can dispatch the leech. Shortly the Turtles return with Splinter. Raphael is unconscious once again, and as his family wonders what’s happened now, Raph slumps forward into the water, revealing the much larger leech attached to his back, sucking fluid from the Mutant Turtle. The creature has now grown arms and legs and it rises to meet its attackers. Master Splinter tells his students to stand their ground as he focuses his mind, in attempt to connect with the beast that had disturbed his visions two days earlier… but before the Sensei can make contact, Leonardo chops it into pieces. Raph groggily awakens and Leonardo apologizes to Splinter for reacting. The Sensei tells his student that their current lessons are designed to teach them how to protect themselves with other means than blades, but hopefully the threat has passed. The next morning the Turtles are once again practicing with Master Splinter. Yet again, Raphael is having trouble focusing his mind on the lessons. The Sensei tries to reach into Raphael’s mind, but his own fear and doubt prevent him. Suddenly, Raph breaks ranks and persues a dragonfly with childish glee. Splinter ends the lesson and Michaelangelo asks why all of them must suffer when Raph acts coo-coo… the Master does not answer. Back at the farm, April and Casey join the Turtles and Splinter for dinner. All eyes are on Raphael as his food is placed before him. Raph smiles innocently and then smashes his hand down on the plate, splattering the room, and everyone in it, with goulash. Raph bursts out laughing as the others glare at him. As time passes, everyone is dismayed as Raph reverts more and more into a normal turtle. 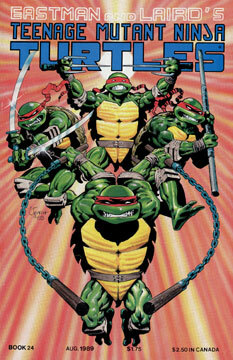 Splinter tells Leo, Don and Mike that the leech is responsible for Raph’s condition – that it must have sucked the Mutagen out of Raphs system, and so he’s returning to his original form. The Turtles will have to find the leech to save Raph, so the group head down to the river. As the TMNT search the waters, they find nothing. April asks Splinter if they can simply recontaminate Raph with Mutagen, but the Sensei points out that the cannister that contained the ooze is empty and there is no way to contact the aliens from the T.C.R.I., so there is no Mutagen to be had. As the skies darken, Casey announces that they should call it a night. The Turtles argue against it when they’re interrupted by a ranger, who thinks our heroes are fishing illegally. Casey nervously points out that they’re merely swimming and that his friends are trying out their new “turtle costumes.” Raphael then escapes from April’s grasp and swims towards the lawman’s boat. As Raphael reaches the craft, the ranger reaches down and grabs the Turtle’s hand. “I just need to get ahold of you one last time, heee heee!” the game warden cackles as Raph mews in anguish. The ranger lets Raph drop back into the water as he stands, revealing his face – it’s the leech, now mutated into a bipedal monster! With heavy hearts, Leo, Don and Mike recall how they had tortured Raph with the leech mere days ago. The brothers then gear up in grim determination and prepare to hunt down Bloodsucker.